Are you looking for new ways to engage your fan base? 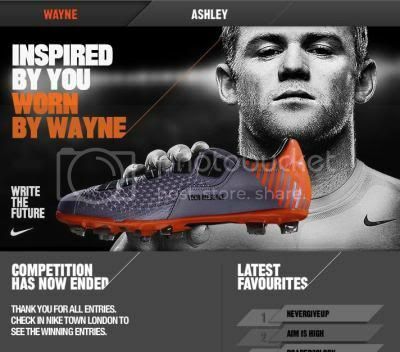 Nike is capitalizing on the buzz leading up to the 2010 World Cup in South Africa by offering a "Inspire the Boot" promotion that offers fans a chance to have their favorite personal messages stitched on the boots of the world's greatest players throughout the tournament. 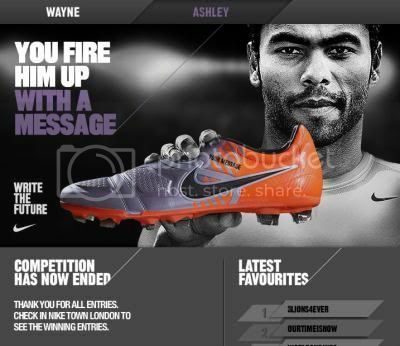 Nike created a microsite and Facebook application to support the campaign, which gives fans a unique chance to inspire soccer stars Wayne Rooney and Ashley Cole. Nike gave consumers the chance to submit their favorite 12-character entries online until May 18th before the winning inspirational slogans are selected. The winning boots will be unveiled at NikeTown London and will be on tour throughout the World Cup in South Africa. An unbelievable offer!